Here are the three best Cantilever Umbrella Base Weight options. Read on for details! All cantilever umbrellas need to be weighted down in order to prevent them from falling over. If users don’t support their offset umbrella, it will likely topple over in a wind gust. This will damage the umbrella, and damage your guests! 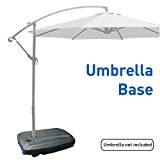 After a great deal of research, we have determined that the best cantilever umbrella base weight is the EasyGoProducts 60 Liter Weighted Cantilever Umbrella Base [Amazon Link]. This unit can supply up to 211 lbs of weight when filled with sand, or 135 lbs when filled with water. Its major differentiating feature is that it has wheels to enable users to easily move their cantilever umbrella when necessary. The EasyGoProducts base is thoughtfully designed and has a fantastic feature set. That said, it’s not cheap! Cantilever umbrellas (also known as offset umbrellas or sometimes side mount umbrellas) are beautiful, dynamic pieces of patio furniture that can elevate the decor of a deck or garden space. They seem to float unsupported in the air. Proper support of this style umbrella is key to making the whole system work. No one wants the umbrella falling over on grandma’s head during a gusty summer afternoon! There are a variety of ways to secure an offset/cantilever umbrella, and this article will cover a few of those options and a few different circumstances. Specifically, it will focus on DIY universal weight options. For off-the-shelf cantilever umbrella bases, click here.